Lots of things to love are presented in bright, bold pictures. Each page offers a simple imperative (or two)—“Love”—followed by an object to love. 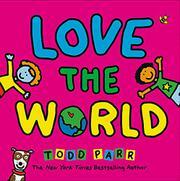 The first is “Love the world,” and the illustration, against a sky-blue background, shows the Earth in green and blue with a big red heart affixed. Other things to love range far and wide: your face, your nose, your toes, your eyes, your size. In the “Love your toes” picture, a bright pink pig wallows on its back in a large patch of brown mud. Love “the bees” and “the trees”; love “making art” and “sharing your heart”; love “your walk” and “your talk.” “Love taking a stand” depicts a smiling Statue of Liberty holding a sign that reads “Welcome, friends!” The animals in “Love the sea” are a variety of colors. Those in “Love the land” have wild patterns as well, like a purple elephant with multicolored polka dots. Parr’s people are his customary assemblage of very diverse humans, including blue and purple people, and an orange child with green hair smiles from a wheelchair. Parr’s simplicity is integral to the power of his book. His positive messages are bolstered by the sunniness of his illustrations, which could have been drawn by a young child. They’re done on a drawing tablet, starting with bold black lines and dropping in vibrant color.